The Prettiest Doll by Gina Willner-Pardo is a middle grade novel that could be useful in teaching young girls they are more than just the sum of their body parts—if only there weren’t so many complex subplots clouding the storyline. 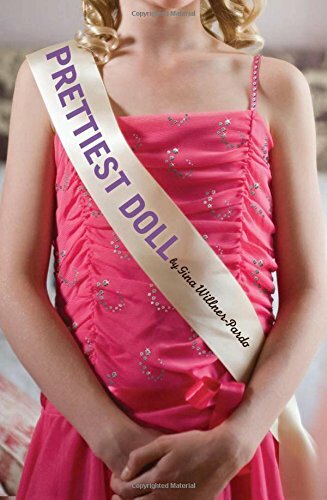 The book opens to the world of 13-year-old Liv (Olivia), a seasoned beauty contestant living in Luther’s Bridge, Missouri, who is practicing to compete in The Prettiest Doll pageant. Liv is pretty, experienced, and blessed (or cursed) with a relentless pageant mom who accepts nothing less than a perfect performance, so Liv should be a cinch to win. The problem is Liv has just reached that age where she’s wondering if there isn’t more to life than just being gawked at by pageant judges. The answer, of course, does not come from her mother, an overweight taxidermist with inner demons who is so obsessed with seeing Liv win yet another pageant she spends all her money “dolling” up Liv. Liv wants to please her mother, but her heart is just not in it. She finally runs away with Dan, a troubled teen she meets during a church function. Their destination is Chicago and the apartment of a once-important fixture in Liv’s life: her beloved “Uncle Bread.” Uncle Bread apparently left Luther’s Bridge without explanation when Liv was a little girl, so she is not just running to him to escape the grueling world of pageants, she is also expecting answers about his abrupt decision to leave. Dan, the boy she runs away with, is 15 years old but has the body and features of a ten year old. He is running away to keep from taking the growth hormone shots his mother is trying to force on him. His plan is to find his father, who left their family long ago and started another family in Chicago. Once in Chicago, Liv and Dan have many coming-of-age experiences. They drop in on Dan’s father, who is obviously not happy to see him and does not even ask him to come inside. They also hide from the police (who are on the lookout for the runaways), and spend a platonic night sleeping close to each other on a movie theater floor. In the end, they realize they cannot continue to run from their troubles, so they return to Luther’s Bridge to resume their former lives. Unfortunately, The Prettiest Doll is a disappointment. The story begins at a slow pace and never quite speeds up, and the author introduces so many characters and plot twists that readers may come away wondering what the book is actually about. For example, Liv’s best friend Imogene is mentioned several times, yet aside from the fact that she likes horses, nothing about her—not even how she feels about Liv—is ever fully explored. She seems to exist only to demonstrate how much Liv yearns to be a “normal” girl with plain looks who can get dirty without having to worry about hair, clothes, and makeup. Uncle Bread’s abrupt disappearance and the left-field rumors of his homosexuality (perpetuated—and possibly originated—by Liv’s mom) are also never explained. They simply fizzle out as the plots and subplots make their twists and turns. There is also no satisfactory explanation of why Dan’s father left Dan and his mother, why the stepmother is so cold toward Dan, or why the father appears to be as miserable in his new life as he was in his former. Also, although this is a book about beauty pageants, the author deals with them on a rather superficial level, never revealing any behind-the-scenes looks at pageant life one would expect after reading the book’s title and premise. This book may help to open a teen discussion about pageant life, family dynamics, and the relentless drive for perfection, but readers hoping for a deeper look into the controversial world of beauty pageants, the lives of beauty contestants, and the intentions of the pageant mothers who groom them will most likely come away unfulfilled.